A free Father's Day E-card is a great way to send your dad a message of love straight to his inbox. These digital cards are all free and make it so easy to let dad know you care. The few minutes you take to send the E-card will lighten up his whole day. You'll find touching and funny Father's Day E-cards below that's sure to speak to your dad's personality and let him know just how important he is to you. 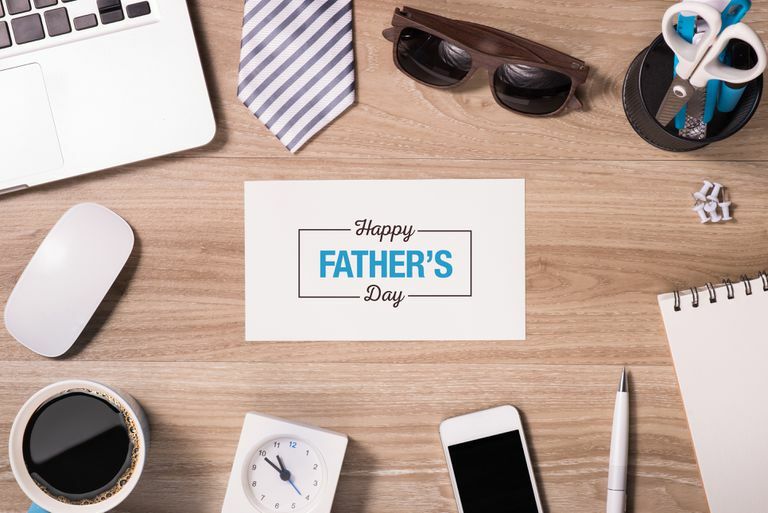 If you don't find the perfect E-card for your dad, check out our picks for the best free E-card websites that might include what you're after. Punchbowl has a free chalkboard-style Father's Day E-card that says "Dad You Are the Best" in white and blue chalk against a black background. Inside the card reads "Wishing You the Best Father's Day Ever!" with room for a custom message to dad. You can include a gift card with this E-card for Father's Day as well as adjust the font style, color, spacing, size, and more. You're also able to change the envelope liner, postage image, and rubber stamp message. Add one or more dads to the recipients list, with either their phone number or email address, and then send them off. When viewed, this free Father's Day E-card shows fun animations of it coming out of the envelope, and even opens automatically. You dad can reply directly from the E-card if he chooses to. You have to make a free user account to send this digital Father's Day card, and ads are included by default unless you want to pay to have them removed. Here's another Father's Day E-card from Punchbowl, this one with a wood grain finish that simply says "Happy Father's Day." Inside the card,​ it says "Wishing You a Happy Father's Day" with room for you to leave a custom message. All this comes packed inside a fun virtual envelope. Open Me has designed this free Father's Day E-card for any dads and kids who have bonded over the Star Wars movies. It's a black starry card that says "I Am Your Son." There isn't text pre-filled in this E-card but you do have an opportunity to write something yourself and even add a couple images before sending. A user account is required after editing and before sending the card. You can register with Facebook or your email address, and you can send the Father's Day E-card over Facebook or through email. This free E-card for your dad can be scheduled for a later date — great if you're making it way before Father's Day and want to ensure its arrival — or send immediately. If you're sending the E-card in the future, you'll have an opportunity to invite your family or friends to sign the card with you before it goes out. Pingg has this free Father's Day E-card with blue and gray stripes that says "Happy Father's Day". There's even room for you to add your own photo. This card is shown with some party details but you can delete those before sending to make it a regular Father's Day greeting card. The E-card can be sent over Facebook or through the email form, and you can even purchase the card to have it sent to your dad via regular mail. If you're a little late with your Father's Day E-card, then this funny one from Someecards has got you covered. This free card can be sent via email or just about every social networking platform. Since it's really just a picture, you can't make any edits to it. This Father's Day E-card features several types of grills and wishes the recipient a "Happy Father's Day." There's quite a retro feel to this Father's Day card that your dad is sure to appreciate. Send this Father's Day E-card through Facebook or email, or mail the E-card from your computer directly to your dad's house. Take the traditional route with this free Father's Day E-card that features a blue suit and an orange tie wishing dad to have a great Father's Day. The inside of this card says "Wishing you a very Happy Father's Day!" with room left for you to add your own custom message in whatever font or color you want. Before sending it, you can also customize the virtual postage stamp and some other envelope details. You can even include a gift card with this digital Father's Day card. When finished, this free Father's Day E-card can be sent to your dad over text or email. This Father's Day E-card is for the dads out there who just can't get enough golf. You can customize this Father's Day E-card with your own personal message before you send it off, which you can do over Facebook or email. This stunning Father's Day E-card may just take dad's breath away when he opens it. A silhouette of a father and his son is featured on this card and the custom title and message are up to you. Send this free E-card to your dad with Facebook or in an email.